steve was a awesome sales man we came in looking for a car today and walked away with a great van thanks alot steve ! Chris is a great salesman. Chris took every extra step to show great customer service. He answered every question throughly and honestly. I would do business again and will bring business to World Hyundai. chris davis was a great friendly sales rep he helped me find a car for my budget and it was a car i wanted best carshopping experience ever hands down !!!!!!!!!!!! everything was review to me and i understood everything that was sign our oral agreements. Damon gave great customer serivce. 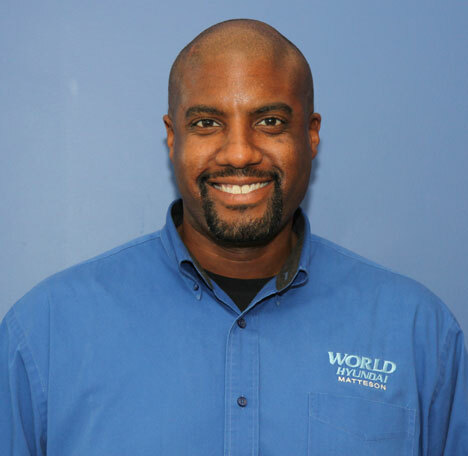 My experience here at World Hundai has benn wonderful, the sales person Duane Jackson was on track very helpful and lets not forget awesome. Mr. Crawford was and is WONDERFUL, FANTASTIC AND GREAT. My overall experience was impeccable. He is an ASSET to your company. He is a SUPERB salesman. Mike was very polite from the moment he said hello. He didn't sugar coat anything and he was very real and gave us the best deal possible. His professionalism shined immediately. We really appreciated the fact that he was not just interested in making a sale, but also how this deal would effect us. Five stars is an understatement of the service Mike Houston provided for us. Was very satfily with the saleperson . Antoine was very polite, and consistent. He worked very hard at getting us the best deal for our budget. World Hundai service was outstanding. I am glad to hear you are pleased. Thank you for coming in today.